In my experience, if you’re an Australian freelancer, then your main options for being paid include: bank transfer, PayPal, cheque, and cash. My invoicing software also recommends Stripe and Authorize.net, but I have no idea what those are, so we’ll focus on the pros and cons of the first four options I mentioned. To date, I’ve never received payment for a copywriting job in cash. And I don’t know why you would want to. I imagine that receiving cash would necessitate meeting your client to collect it, which would take time out of your day that you could be using to earn an income. Accepting payments in cash could also draw attention to you from the tax office, which is understandably suspicious about cash transactions. And if you’re like me and don’t tend to use cash in your day-to-day life, then you’re also going to need to deposit the stuff as well. If you want to receive payments in cash, be my guest. But it’s not an option I’d recommend. With the exception of bank cheques for buying cars etc., I don’t know anyone under the age of 50 in Australia who actually still uses cheques. Admittedly there’s nothing inherently wrong with cheques, but if you want to get paid via cheque for work in Australia, you’ll need to consider the following things. First, many people don’t actually have a cheque account (an account they can write cheques from). I’ve never had one in my life. Now obviously businesses are more likely to have cheque accounts, so if you’re a B2B sort of a freelancer, then maybe this will be ok. But you don’t want to make it harder for people to pay you, and demanding cheques could make it harder. Cheques don’t arrive immediately, either. They have to be posted, so you’ll be forever waiting for them to arrive. If you work from home, you probably won’t want to be handing out your address to everyone, so that means you’d need a PO Box. But a PO Box costs money, and it has to be checked regularly. All that would take time and money, and the more time it takes, the longer you have to wait to be paid. The other problem with cheques is that they take time to clear. So that means that you’ll be waiting even longer for the mullah to appear in your account. PayPal is promoted as the safest way to pay online, but what is it like to be paid online with PayPal? When your client pays you via PayPal, the money will arrive in your PayPal account immediately. However, unless you’re using PayPal for all your purchasing, you’ll need to transfer it to your bank account. This will take an additional couple of days. PayPal deducts a small fee for every payment you receive. In Australia, this is currently 2.4% plus 30 cents, although if you receive more than $5000 per month, you can apply for a lower rate, which starts at 2% plus 30 cents for $5000-15,000 per month. Of course, if you use PayPal regularly, you can take this fee into account when setting your prices, thus passing it on to your clients. There is one main benefit for your clients (and thus potentially for you) when it comes to using PayPal: They can pay using credit card. Depending on your industry and who your clients are, this may be a major benefit, or it may be fairly insignificant. The biggest benefit of PayPal in my experience is that it’s by far the easiest way for an international client to pay you. You don’t have to worry about bank account details and transfer times, and they barely have to worry about the exchange rate. Because of this, PayPal is my preferred payment method for my international clients. For Australian clients, my preferred method for getting paid is bank transfer. With a bank transfer, I only have to wait two to three days for the money to arrive in my account – much faster than waiting for a cheque to arrive and then clear, and a little faster than PayPal. If my client is with the same bank as me, the money will usually arrive the same day. There are no fees for bank transfers, so I get all the money, and don’t have to charge my clients an extra fee to cover a PayPal levy. Because the transactions are recorded by my bank, it makes keeping track of money easier, and, as long as I report my earnings accurately (which I do), it keeps the tax office from becoming concerned about me. There you have it – my run-down of the pros and cons for being paid for your freelance work via cash, cheque, PayPal, and bank transfer. If you’re an Australian like me, then I recommend you go with the last two options – PayPal for international clients, and bank transfer for Aussie clients. Are you a freelancer? How do you ask your clients to pay you, and why? Share in the comments below. Did you find this article helpful? Then I’d love to hear about it – let me know in the comments below. I’d appreciate it if you could give my post a friendly share on social media too! Go on – you know you want to. 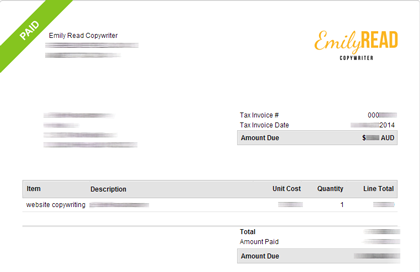 To read my guide to invoicing, check out this article.